The L Series controller is compact in size, yet provides easy expandability, networking capabilities, and a multitude of built-in features. The rack-free design offers system flexibility with minimal panel space. This controller platform provides an excellent solution for customers who strive for performance in a compact and versatile package. It is ideal for mid-size machines as well as larger networked applications. The MELSEC-L Series is the perfect solution for mid-range applications. This high performance controller delivers advanced features with maximum versatility in a small footprint. The compact size, easy expandibility, networking capabilities, and powerful built-in functionalities, make the L Series an ideal solution to meet your diverse needs now and in the future. The L Series CPU modules include built-in I/O functions as standard. This integration enables you to customize standard models to fit specific control needs. These modules extend the controller rack to fit your control sizes. The power supply module supplies electricity to the CPU, input/output, and other L Series modules. The I/O modules connect the control system to input and output devices. I/O modules are available in a variety of types and sizes to suit all system requirements. The analog I/O modules process analog signals for data input and output. They provide an interface to quickly and accurately sense variable levels of voltage and current signals. Easily and accurately count high-speed pulse with this module. Modules for high-speed, high-accuracy positioning control. The Q Series offers multiple CPU types and sizes to best fit your specific application needs. Q Series modules such as power supply, CPU, and input/output must be mounted on a base unit. The power supply module supplies electricity to CPU, input/output, and other Q Series modules. Pulse input and high-speed counter modules support high-resolution devices and allow the controller to sense high frequency pulses. Positioning modules integrate extremely fast and accurate positioning control directly onto the Q Series system. It offers a variety of control schemes to cater to different positioning requirements. Information modules enable comprehensive data collection and distribution. This information exchange improves production efficiency and throughput. 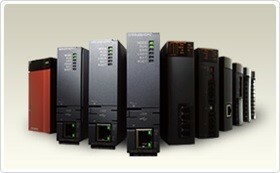 The Q Series offers connectivity to all major control-level networks, providing seamless connectivity to any layer of the factory automation networks. Energy measuring modules monitor a variety of energy information including current, voltage, power, and frequency. 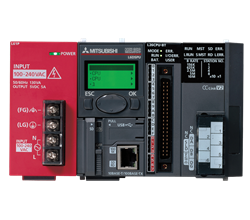 MELSEC iQ-R Series: As the core for next-generation automation environments, Mitsubishi Electric has created an automation controller with added value while reducing TCO. The MELSEC iQ-R Series has been developed from the ground up rationalizing common problems into seven key areas: Productivity, Engineering, Maintenance, Quality, Connectivity, Security and Compatibility. It uses a three-point approach to solving these problems: Reducing TCO, increasing Reliability and Reuse of existing assets. 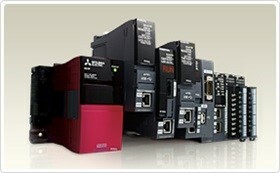 Programmable automation controllers catering for various applications. The base units are needed for installing devices such as power supply, CPU and I/O modules. Various types are available to suit multiple system requirements. This module is used for providing the electrical power for the CPU, input, output, and other modules on the base unit. Devices such as switches, indicator lamps, and sensors can be easily connected to the control system using the digital I/O modules. Analog modules are the main interface between the control process and the automation system and are specifically designed to interface with sensors that process varying voltage and current signals. Distinct set of high-accuracy, fast and intelligent control response modules that are ideal for applications requiring high speed and precision. This module group enables information exchange with multiple control systems. The module lineup improves production efficiency by collecting and controlling various production information.